Nexsound and The Lollipoppe Shoppe present an ethnotronic collaboration of the neo-folk band Ojra and Andrey Kiritchenko. 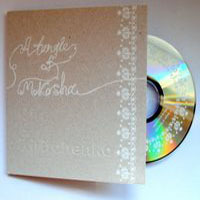 A Tangle Of Mokohsha is a 10 track album in which songs of pagan and Chiristian origins collected by Ojra in their ethnic expeditions through Eastern Ukraine infused on electronic music by Andrey Kiritchenko. These interpretations of authentic songs glister of versatile sonic palettes. Here one can distinguish ambient and electronic experiments, field-recordings of nature and bright sound of traditional instruments. This, without a doubt, vivid piece of work has ability to conduct the listeners imagination and to melt him/her down inside of the music. Halyna Breslavets is teaching Ukrainian folk vocal in Kharkov’s State Academy of Culture. For the last 10 years the artists were collecting and researching Ukrainian folk music Ojra are laureates and participants of many folk, jazz and rock tenders and festivals. They collaborated with experimental theater Yara Art-Group and La MaMa/New York. had collaborations with Francisco Lopez, Kim Cascone, Sara Lunden, Jeff Surak, Kotra, the Moglass etc. ; nominated and awarded by Qwartz Electronic Music Awards.